"CA 50" redirects here. For the congressional district, see California's 50th congressional district. This article is about the section of U.S. Route 50 in California. For the entire route, see U.S. Route 50. In the U.S. state of California, U.S. Route 50 (US 50) runs east from I-80 in West Sacramento to the Nevada state line in South Lake Tahoe. Portions within Sacramento are known as the Capital City Freeway and El Dorado Freeway. The western half of the highway in California, from I-80 through Sacramento and Placerville to Exit 60 in Pollock Pines is a four-or-more-lane divided highway, mostly built to freeway standards. US 50 continues as an undivided highway with one eastbound lane and two westbound lanes until it reaches the canyon of the South Fork American River at Riverton. The remainder of the highway, which climbs along and out of the canyon, then over the Sierra Nevada at Echo Summit and into the Lake Tahoe Basin, is a mainly two-lane road. The US 50 corridor is a historic one, used by many 49ers who came to California during the Gold Rush as well as the Pony Express. In 1895, part of the present-day route was designated as California's first state highway, and it was later considered as a scenic alternate of the Lincoln Highway. Much of US 50 was constructed during the initial construction of the California state highway system. During the second half of the twentieth century, US 50 was gradually designated and converted into a modern highway. US 50 has been added to the California Freeway and Expressway System by the state legislature. The highway east of SR 49 is eligible for the State Scenic Highway System, and has been recognized as such except within the South Lake Tahoe city limits. US 50 begins in West Sacramento, where I-80 leaves the West Sacramento Freeway onto a bypass of Sacramento. The old route of I-80 through Sacramento is signed as Business 80 (Capital City Freeway), which overlaps US 50 on the West Sacramento Freeway to the split with SR 275, then over the Sacramento River on the Pioneer Memorial Bridge and across I-5 to SR 99. US 50 is part Interstate Highway as well, carrying the unsigned designation of Interstate 305 through its interchange with SR 99. There Business 80 splits to the north, SR 99 heads south, and US 50 continues east as the El Dorado Freeway. This freeway parallels Folsom Boulevard and the American River east-northeasterly through the suburb of Rancho Cordova to Folsom. Entering El Dorado, US 50 continues eastward through the foothills of the Sierra Nevada via El Dorado Hills, Cameron Park, and Shingle Springs to downtown Placerville. The freeway temporarily ends, and US 50 has several at-grade intersections in Placerville, including SR 49. Leaving Placerville, the freeway restarts, only to end several miles later. The final section of freeway begins as a bypass of Camino, and ends at Exit 60 at the east end of Pollock Pines. Just east of Exit 60, US 50 continues as an undivided conventional highway with one eastbound lane and two westbound lanes, entering the river canyon of the South Fork American River near Riverton and crossing to the north side of the river near Ice House Road. From Ice House Road to the crest of the Sierras, US 50 is a steadily rising mostly two-lane road, staying just north of the river except for a 1995 cutoff that crosses the river twice in quick succession west of Kyburz, the boyhood home of ski racer Spider Sabich. Several hairpin turns take the highway up a grade east of Strawberry, after which US 50 continues east alongside the river to its source at Echo Summit. Echo Summit is the highest elevation U.S. Route 50 reaches in California at 7,377 feet (2,249 m). From Echo Summit down to the Lake Tahoe Basin, the roadway slowly descends the side of a steep hill; it then curves northeast to its south junction with SR 89 (which heads south to Luther Pass) beginning co-signing of SR 89, and then turns northward near the city of South Lake Tahoe. Where US 50 and SR 89 split, at an intersection known as "The Y", the former turns east on the four-lane Lake Tahoe Boulevard, which it follows to and along the south shore of Lake Tahoe, then it enters the state of Nevada. The earliest roads used by Europeans to cross the Sierra Nevada into California were branches of the California Trail. The first route near the present US 50 was the Carson Route, laid out in 1848 by an eastward Mormon party that wanted to avoid the Truckee Route and its deep crossings of the Truckee River. The group left Pleasant Valley, southeast of Placerville, on July 3, following Iron Mountain Ridge up to the crest of the Sierra at Carson Pass and then descending through Carson Canyon into the Carson Valley. Along the Humboldt River in Nevada, the Mormons met Joseph B. Chiles, who was leading a westward wagon train to California, and told him of their new trail. Although this new Carson Route crossed two summits — Carson Pass over the crest of the Sierra and West Pass over the Carson Spur just to the west, these crossings were easier than Donner Pass on the Truckee Route, and only three fords of the Carson River were required. The route became the primary westward route into California at the start of the Gold Rush. 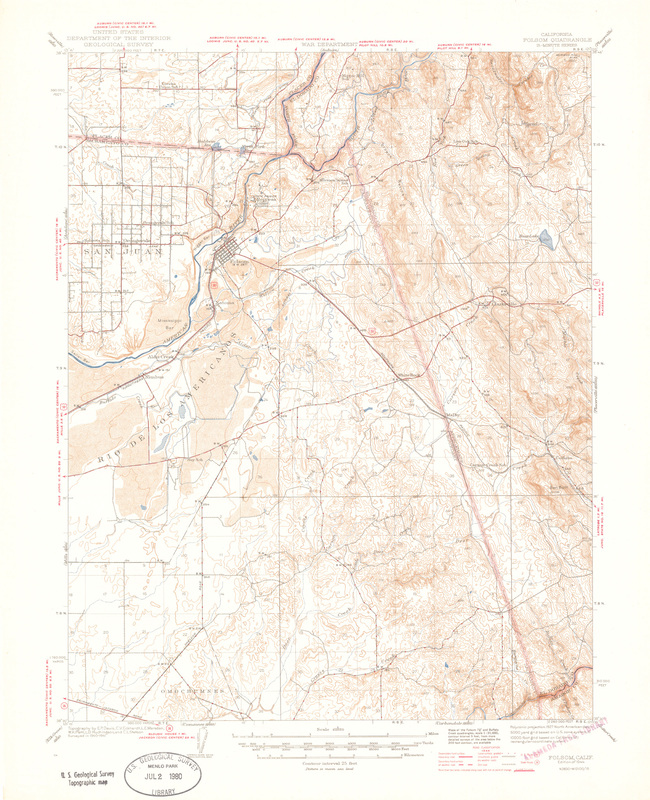 Through California, the general alignment of the Carson Route, in terms of today's highways, was State Route 88 over Carson Pass and Mormon Emigrant Trail and Sly Park Road to Pleasant Valley. John Calhoun Johnson of Placerville surveyed and cleared a shorter, lower (and thus less snow-covered) trail east from that town in 1852, completing the work by the summer. Rather than following the ridge to the Sierra's crest as the Mormons had, Johnson headed eastward to the South Fork American River, crossing to its north side near the present Pacific Ranger Station in order to follow Peavine Ridge around a rocky stretch of the river. Returning to the river between Kyburz and Strawberry, he then continued alongside it to the crest at Johnson Pass, where a steep slope descended to Lake Tahoe. Within Nevada, his route generally followed the lake to Glenbrook, where it turned inland and crossed the Carson Range over Spooner Summit into the Carson Valley near Carson City. This trail, known as Johnson's Cut-off, generally followed the present US 50, with notable deviations only just east of Placerville (via Carson Road), over Peavine Ridge (roughly following Peavine Ridge Road, some trails, and Wrights Lake Road), just east of Strawberry (via Slippery Ford Road), over the crest of the Sierra (via Johnson Pass Road and Meyers Road), south of Lake Tahoe (via Pioneer Trail), east of Lake Tahoe (via Genoa Peak Road), and from Spooner Summit into the Carson Valley (via Kings Canyon Road). By 1854, Bartlett's Bridge had been built at the trail's westernmost crossing of the American River, allowing wagons to follow the cutoff; it was soon washed away by a freshet on March 7, 1855, and replaced by Brockliss Bridge, several miles to the east. Due to an improvement of the road through Carson Canyon on the old Carson Route, most travelers ended up turning southeast from Johnson Pass over Luther Pass (present SR 89) to join the older route northeast of Carson Pass rather than following the cutoff along Lake Tahoe. Johnson's Cut-off was the only trail that could be used year-round, but it still had problems, as it had been built without use of earth-moving equipment, and thus did not always take the optimal route. The state adopted a survey by Sherman Day in September 1855, but failed to make use of it. Two years later, the counties of Yolo, Sacramento, and El Dorado, all of which would be benefited by further improvements, began planning and carrying out work. The state legislature created a "Board of Wagon Commissioners" on March 8, 1858, and it completed the improvements by the end of that year. This new route had better grades than the old cutoff, deviating from it in several places: it followed the present Smith Flat Road rather than Carson Road east of Placerville, traversed Peavine Ridge much further down the slope, returning to the river west of Kyburz (roughly via the present White Meadows Road, Ice House Road, and Weber Mill Road to US 50 at Granite Springs Road), and crossed into Carson Valley via Luther Pass. By 1860, the immense traffic over the road and lack of maintenance had worsened it to the point that it could no longer be used by stagecoaches. To provide for better maintenance, improvements funded by tolls were authorized. The first of these was built and operated by Kingsbury and McDonald, who improved the old Johnson's Cut-off between Johnson Pass and Stateline, where they turned east over Daggett Pass (now SR 207) in Nevada, connecting Lake Tahoe to the Carson Valley via a shorter route than that over Luther Pass. Two other competing toll roads soon opened across the Carson Range: one built by Rufus Walton from Spooner Summit down Clear Creek to the valley (now part of US 50), and an 1863 improvement of the original Johnson's Cut-Off along the lake, across Spooner Summit, and through Kings Canyon to Carson City. West of Johnson Pass, the Slippery Ford Grade down to Strawberry was rebuilt by George W. Swan. The first toll-supported bypass of Peavine Ridge was built by Oglesby and opened in 1861, leaving the old road from Placerville at Pollock Pines, following the ridgetops and slopes south of the South Fork American River, crossing the river east of White Hall, and then following US 50 along the north bank to the 1858 county road west of Kyburz. Johnson began work on a lower-grade replacement on the north side of the river in 1864, but stopped when Pearson and McDonald opened a road over the present alignment of US 50, leaving the pre-1861 main road southwest of Brockliss Bridge and following US 50, across the river at Riverton, to Oglesby's road east of White Hall. Toll collection ended in California in 1886, when El Dorado County bought the privately improved sections and made them public roads. West of Placerville, the wagon road headed south to Diamond Springs, where it turned west along the original Carson Route over relatively gentle terrain to Sacramento, generally following the present US 50 on parallel surface roads, such as Pleasant Valley Road and White Rock Road. The Pony Express used this route from its beginning in April 1860 until July 1, when its western terminus became Folsom on the Sacramento Valley Railroad. (The route was further cut back to Placerville, where messages were passed to the telegraph, from July 1861 to its discontinuance in October.) The Placerville and Sacramento Valley Railroad reached Latrobe in 1864, Shingle Springs (on the old Carson Route west of Placerville) in 1865, and was finally completed to Placerville in 1888. As the railroad extended east, the western terminus of the stage lines followed; the completion of the First Transcontinental Railroad in 1869 took most of the traffic off the Placerville wagon road. At the dawn of the automobile era, the state legislature authorized California's first state road on March 26, 1895, by creating the post of "Lake Tahoe Wagon Road Commissioner" to maintain the road from Newtown Road near Smith Flat (just east of Placerville) to Nevada. The county deeded the 58-mile (93 km) road to the state on February 28, 1896. Funding was only enough for minimal improvements, including a new stone bridge over the South Fork American River at Riverton in 1901. The Department of Engineering took over its maintenance in 1907, immediately completed a survey and posted granite milestones that marked the distance from Placerville, and in 1910 started sprinkling the dirt road with water in summer to keep down dust (as had been done in the 1860s). A 1915 law added the short distance from Smith Flat west to the east limits of Placerville to the state road. With the passage of the first state highway bond issue in 1910, the Department of Engineering was directed to lay out and construct a system connecting all county seats. Placerville, seat of El Dorado County, was connected to Sacramento by the 46.5-mile (74.8 km) Route 11, which followed Folsom Boulevard from Sacramento to Folsom, Bidwell Street and Placerville Road to White Rock, the old Carson Route to El Dorado, and Forni Road and Placerville Drive to Placerville. Between El Dorado and Placerville, the state had two routes to choose from, including one via Diamond Springs (present SR 49), where it decided improving a cut would be too expensive. Instead, it chose the "O'Keefe grade" (Forni Road), following the old road for about 4 miles (6 km) and then building a cutoff (now part of Placerville Drive) to the Green Valley road. 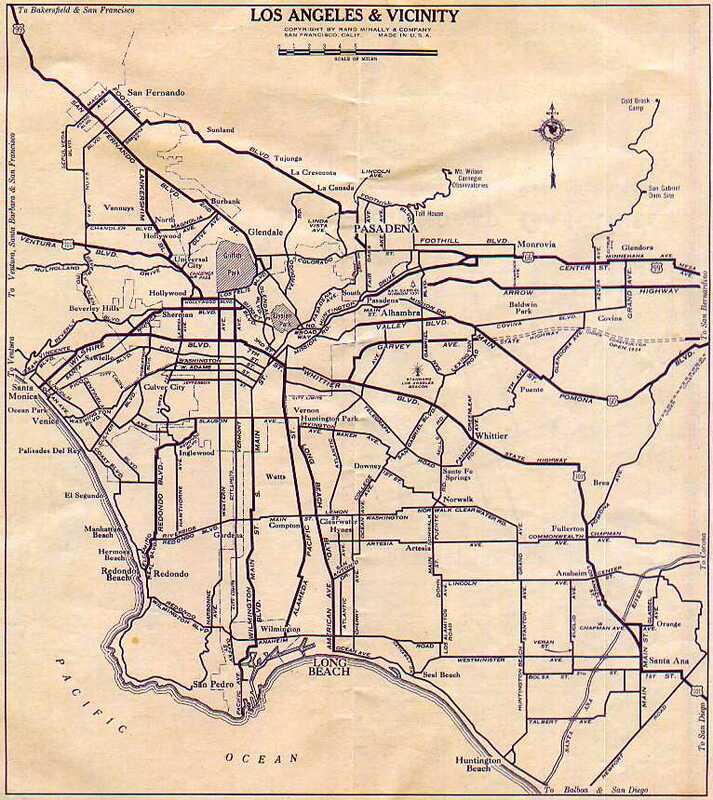 In 1917 the mileage that had been added by special laws, rather than as part of bond issues, was consolidated with the rest of the system, and Route 11 was extended east to the state line. (The route was extended farther, from Sacramento southwest to Antioch via present SR 160, in 1933.) The third bond issue, passed in 1919, included funds for the improvement of 10 miles (16 km) from Placerville east to Sportsman's Hall, by which time paving was complete west of Placerville. The Lincoln Highway, one of the earliest marked highways across the country, split in two over the Sierra Nevada. The main route followed the present I-80 alignment over Donner Pass, but an alternate "Pioneer Branch", designated as part of the initial routing in 1913, turned south at Reno, Nevada to Carson City and then crossed the Sierras via Johnson Pass and the Placerville route. Contrary to the Lincoln Highway Association's policy of marking the most direct route, this deviation was explained simply as "for those tourists desiring to see Lake Tahoe". However, it actually became shorter in 1921, when the Fallon Cut-off opened from Carson City directly east to the main route near Fallon, bypassing Reno. The U.S. Highway system was created in 1926, and this route (along with the main Lincoln Highway east of the cutoff) became part of U.S. Route 50. (The Donner Pass route was U.S. Route 40, crossing Nevada on the Victory Highway.) 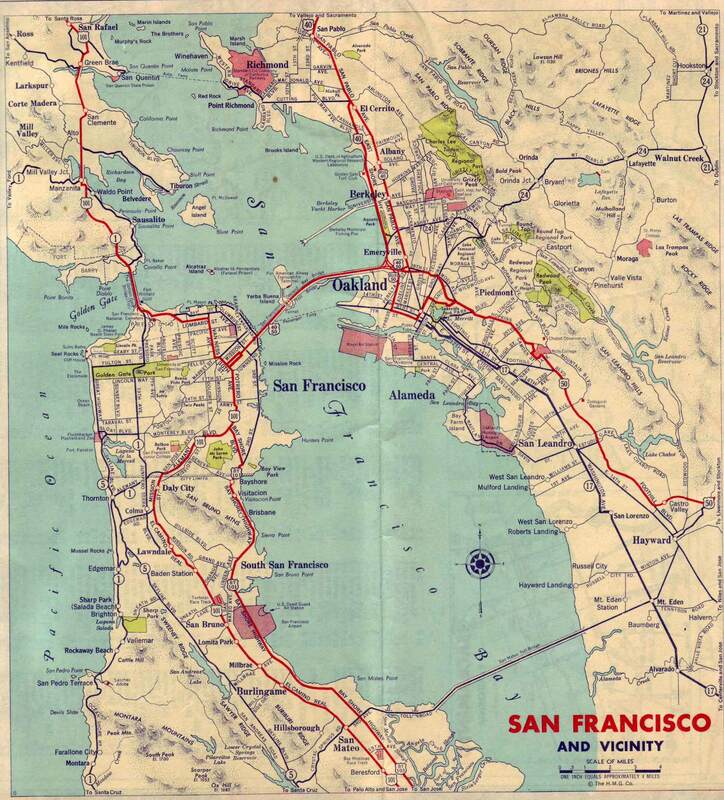 US 50 initially ended in Sacramento, where motorists could follow US 40 (Victory Highway) southwest to the San Francisco Bay Area or turn south over US 99 to Stockton and take US 48 (Lincoln Highway) west over Altamont Pass. Originally, US 48 was a road connecting the San Francisco Bay area with the San Joaquin Valley, traveling from San Jose to near Modesto, largely following the future routing of US 50, which replaced US 48. Its western terminus was located near the present location of the Interstate 238/Interstate 880 interchange. It generally followed the route of current Interstate 580 to the Interstate 205 junction. From here, US 48 continued east on Interstate 205, then followed Old Highway 50 (present I-205 Bus.) through Tracy, thence to Interstate 5. It then followed Interstate 5 to SR 120, where US 48 followed SR 120 to the old location of the SR 99/SR 120 interchange (present day intersection of Main and Yosemite in Manteca), the location of its eastern terminus. 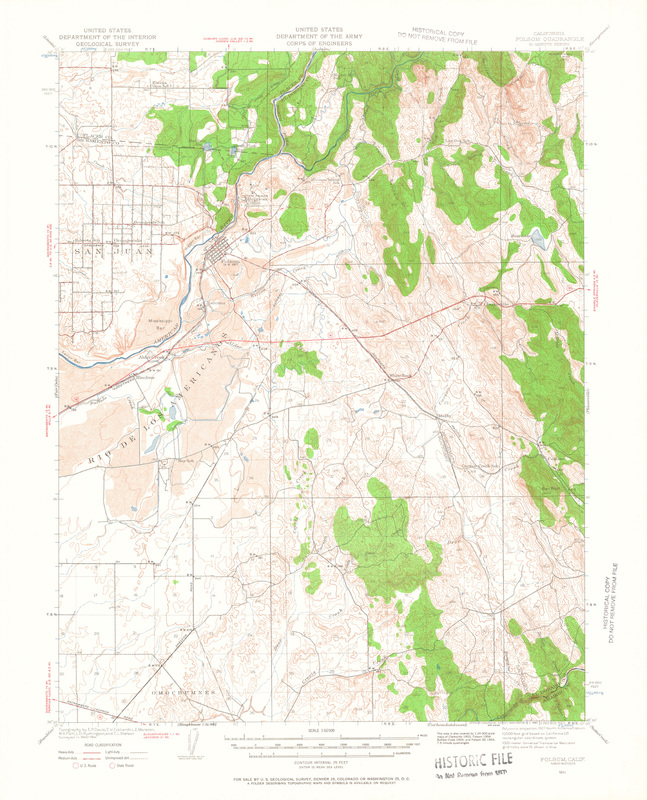 At this time, US 50 was improved but unpaved east of Placerville. As part of the state project to pave this portion, the old road was bypassed in several areas, completing the final two-lane alignment. These realignments included Broadway, bypassing Smith Flat Road, at Smith Flat (1932), a new route around Slippery Ford Grade east of Strawberry (1931), and a new route through South Lake Tahoe, leaving behind Pioneer Trail (1931). The crossing of the Sierra crest at Johnson Pass was bypassed in 1940 by a better-quality route over Echo Summit; the lower part of the current road east of the summit opened in 1947, bypassing Meyers Road. West of Placerville, several major two-lane relocations were built. A bypass (now Mother Lode Drive) around El Dorado and the winding Forni Road was completed in 1938, and the improvement was extended west to Shingle Springs in 1947. A short relocation north of White Rock, between Bidwell Street and Bass Lake Road, opened in 1940, and was extended west beyond Hazel Avenue, bypassing Folsom, in 1949. By the early 1930s, US 50 had been extended to San Francisco via the former US 48 by overlapping US 99 from Sacramento to Stockton and replacing US 48 over Altamont Pass to US 101E (Foothill Boulevard at Castro Valley Boulevard) near Hayward. It was extended over the new Bay Bridge at the time of its opening in 1936, replacing US 101E on Foothill Boulevard and the present MacArthur Boulevard to the Bay Bridge Distribution Structure in Oakland. As the new MacArthur Freeway (now I-580) was constructed, US 50 was moved to it. This extension was officially eliminated in the 1964 renumbering, but it remained on maps and signs for several more years before being replaced by I-80 over the Bay Bridge, I-580 over Altamont Pass, I-205 business route through Tracy, I-5 to Stockton, SR 4 (Charter Way) and SR 26 through Stockton, and SR 99 to Sacramento. For many years, the four lanes from Sacramento stopped at Riverton, where the original two-lane road continued through the canyon and over Echo Summit. The state rejected a proposed $133 million total realignment between Riverton and Kyburz in 1985, instead opting for a less expensive program of spot improvements including new bridges and passing lanes. Portions of the work were completed by 1987, including a four-lane bridge at Riverton (though two lanes are used by traffic turning at Ice House Road at the east end of the bridge). Between White Hall and Kyburz, a pair of four-lane bridges over the South Fork American River, carrying a realignment across a bend in the river, were dedicated on May 31, 1995, as the El Dorado County Veterans Bridges. The route through the South Fork American River Canyon remains vulnerable to mudslides and other storm damage. One particularly bad slide closed the highway east of Riverton for 28 days from January 24 to February 21, 1997, only a week after a similar 17-day closure caused by flooding on January 1. A project to make more permanent repairs and prevent future closures began on July 31, and from September 2 to October 24 the highway was closed during the week to allow for more efficient reconstruction. The state signed the detour, which followed Sly Park Road, Mormon Emigrant Trail (the old ridgetop Carson Route), SR 88, and SR 89 (over Luther Pass), as Alternate U.S. Route 50, a designation not approved by the American Association of State Highway and Transportation Officials, which generally assigns new bannered U.S. Highways. After the work was complete, signs were left along the route. ↑ 9.0 9.1 9.2 9.3 9.4 9.5 Lua error in Module:Citation/CS1/Identifiers at line 47: attempt to index field 'wikibase' (a nil value). ↑ 20.0 20.1 Howard, p. 175. ↑ California State Assembly. "An act to amend sections 2, 3 and 5 and to add two sections to be numbered 6 and 7 to an act entitled 'An act to provide for the acquisition of rights of way for and the construction, maintenance..." Fiftieth Session of the Legislature. Statutes of California. State of California. Ch. 767 p. 2036. <templatestyles src="Module:Citation/CS1/styles.css"></templatestyles>: "Walnut Creek-Stockton Road near Antioch to Sacramento." ↑ California State Assembly. "An act to establish a Streets and Highways Code, thereby consolidating and revising the law relating to public ways and all appurtenances thereto, and to repeal certain acts and parts of acts specified herein". Fifty-first Session of the Legislature. Statutes of California. State of California. Ch. 29 p. 275. <templatestyles src="Module:Citation/CS1/styles.css"></templatestyles>: "Route 11 is from Route 75 near Antioch to the Nevada State line near Lake Tahoe via Sacramento, Folsom, Placerville and Sportsman's Hall." ↑ California State Assembly. "An act to add Section 253 and Article 3 (commencing with Section 300) to Chapter 2 of Division 1 of, and to repeal Section 253 and Article 3 (commencing with Section 300) of Chapter 2 of Division 1 of, the..." 1963 Session of the Legislature. Statutes of California. State of California. Ch. 385 p. 1175. <templatestyles src="Module:Citation/CS1/styles.css"></templatestyles>: "Route 50 is from Route 80 in Sacramento to the Nevada state line near Lake Tahoe via Placerville." ↑ California State Assembly. "An act to amend Sections 306, 320, 332, 351, 362, 365, 369, 374, 382, 388, 397, 407, 408, 409, 410, 415, 422, 435, 440, 446, 453, 456, 460, 467, 470, 476, 487, 492, 493, 494, 506, 521, 528, and 529..." 1959 Session of the Legislature. Statutes of California. State of California. Ch. 1062 p. 3111. <templatestyles src="Module:Citation/CS1/styles.css"></templatestyles>: "US 50 from Sacramento to the Nevada state line." ↑ California State Assembly. "An act to amend...the Streets and Highways Code, relating to state highways". 1981–1982 Session of the Legislature. Statutes of California. State of California. Ch. 292 p. 1417. <templatestyles src="Module:Citation/CS1/styles.css"></templatestyles>: "Route 50 is from Route 80 west of Sacramento to the Nevada state line near Lake Tahoe via Placerville." Wikimedia Commons has media related to U.S. Route 50 in California. Web cameras by region, including U.S. Route 50. This page was last modified on 4 April 2016, at 04:52.